UK babies! Glossier has finally arrived in the homeland! I know it's been a long time coming, but it's your time to shine. 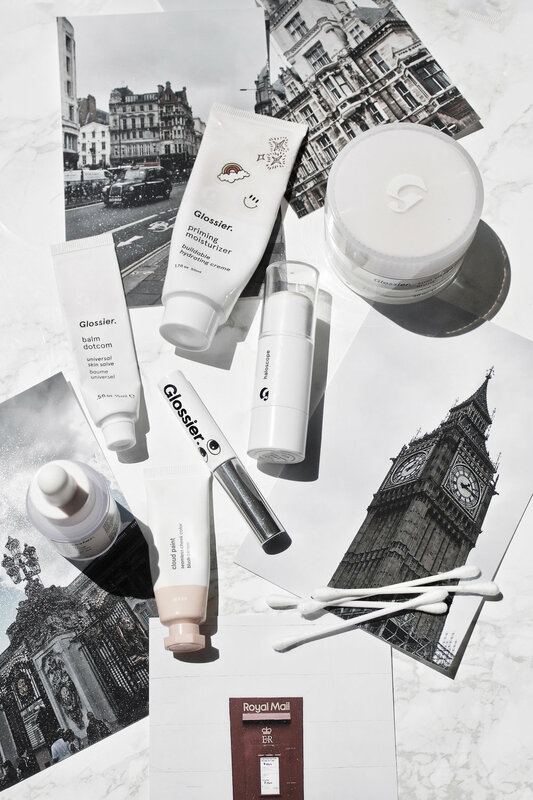 Don't forget to shop glossier.com/reps/amelia for 20% off your order plus free shipping over £25. I thought I'd do a roundup of alllll my many Glossier Reviews so that you can get an idea of what you want! These are just my Glossier-specific brand focused reviews, but if you want to know more just search "Glossier" in my search bar to find everything I've ever written about them. You can also go to my YouTube channel to see some of the products in action! THE SUPERS: "Okay, let me start off by saying that I know I get really overdramatic when I really like a new product. But The Supers by Glossier might actually be bottled magic." CLOUD PAINTS: "I think Glossier have officially launched the product that is the best thing since sliced bread. Cloud Paints are a seamless gel-cream blush and they are literal perfection. Inspired by New York sunsets, these beauts are bringing back the blush game in full force." PRIMING MOISTURIZER RICH: "It's FINALLY HERE! Over a year in the making, the Glossier Priming Moisturizer Rich has launched today and I couldn't be more excited. In case you didn't know, this product was created with tons of input from Glossier fans and Into the Gloss readers and they listened! Priming Moisturizer Rich (hereafter known as PMR) is a dense, luxurious cream that sinks into the skin effortlessly and never feels greasy. It's rich in ceramics and fatty acids, which help to reinforce your skin's barrier and lock in moisture (more on that later)..."
IVISIBLE SHIELD DAILY SUNSCREEN +: "SHE. IS. HERE. And she is a game changer, believe me. Glossier has launched the Invisible Shield and I don't think I've ever been so excited in my entire life. If you've been reading the blog for a while, you know using a dedicated sunscreen is something I find non-negotiable in my skincare routine. I don't care if it's cloudy outside. You use sunscreen every. single. day. But I also know how difficult it can be to find a sunscreen that works for you. They're often heavy and greasy or have a white cast or don't sit well under makeup. Invisible Shield has changed all of this." GLOSSIER BODY HERO: "Skincare for the other 90% of you. Not gonna lie, I'm not a body care person. I use Johnson and Johnson's or Nivea and that's about as fancy as it gets. However, I'm a Glossier stan so any new launch immediately piques my interest. Maybe because everything is always so damn photographic, but mostly because I generally love anything they put out." GLOSSIER STRETCH CONCEALER: "When I first got my Glossier Phase 2 set (post here), I don't think I truly appreciated the beauty that is the Glossier Stretch Concealer. Back then I was still kind of in that 'cover every inch of my skin' phase. Now, however, I'm much more into skincare and perfecting my actual skin and then using makeup to enhance or correct. Aka the Glossier motto, and I am LOVING it."